The ETSC Work Related Road Safety, for Preventing Road Accidents and Injuries for the Safety of Employees (PRAISE), met at the Royal College of Physicians on 31st January and Tom Murphy was invited to represent PAC Ireland. Tom says “agricultural contractors often don’t realise that regulations relating to driving for work apply to them in the same way they do to any employer, so it is important to keep abreast of regulation and and the latest safety measures”. 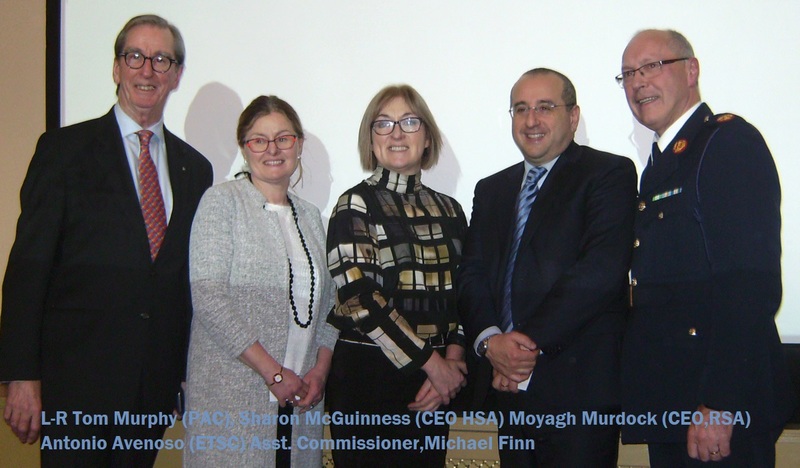 The proceedings were opened by Minister Shane Ross and CEO of the RSA, Moyagh Murdock and CEO of the Health and Safety Authority, Sharon McGuinness addressed the fully subscribed event. We heard from a wide variety of companies and organisations from across Europe in relation to how they manage the safety of their employees who drive in the course of their working day. We also heard about safety measures and ongoing research being undertaken to help reduce accidents relating to driving for work, some of which could be applied to the agricultural sector.